Tell us a little bit about Parker and your role there. Parker Hannifin is a Fortune 250 global leader in motion and control technologies with groups encompassing nearly 70 divisions worldwide, and serving the broadest array of industries including Aerospace, and Energy. Bruce Besch is the Advanced Motion Systems Sales Manager with the Cylinder division, and has product development and support responsibilities for Electrical, Mechanical, and Hybrid products. Parker created a “Hybrid” actuator—what customer needs specifically drove to that design? The need for “Plug and Play” functionality, was a key driver. Devices need to get smarter and be more efficient to survive in today’s economy. It was our goal to provide customers with an actuator that looks and feels like an Electric Actuator but has the power density and fail safe systems commonly found in traditional hydraulic systems. We are striving for simplicity, with 3 levels of operation, simple on/off control, commonly used in Solar Tracking, Speed and Direction Control for use in Valve actuation for the Hydro/Power Generation market, and lastly bus/network units that will simply plug into customer’s networks allowing our customer to talk to them and retrieve information about the actuator with simple 2 wire controls. Tell us some of the main differences between a traditional electric or hydraulic actuator and the hybrid actuator and what you see as making the hybrid superior. Traditional hydraulic actuator systems take more of a centralized design approach, with a Power Unit with the electric motor, pump reservoir and related valving located remotely from the actuators. You need to run hoses or tubing to the actuator. Hydraulic reservoirs are typically large in size and open to breathe, as the actuators are moved, drawing oil from the reservoir when extending. Contaminates and moist air are sucked into the reservoir by default, the reservoir being a common entry point for contaminates. Moisture will condensate on the reservoir top, and rust will occur along with water mixing with the oil which increase the fluid Total Acid Number (TAN). As TAN increases, seal life degrades. The control is achieved by use of effective valving, and there are several at different points . With hydraulic actuator systems, you need a directional control valve, to control direction, a flow controls type valve to regulate speed, and reducing valves to control the actuator thrust. You can upgrade to a proportional type valve and consolidate in a common valve. However, all of these components create pressure loss, which consumes energy and develops heat, thus requiring the addition of a heat exchanger. By contrast, our Hybrid Actuators System (HAS) design consolidates the entire hydraulic system into a single component located on the actuator. Requiring the use to simply hook up a couple of cables locally at the point of use. 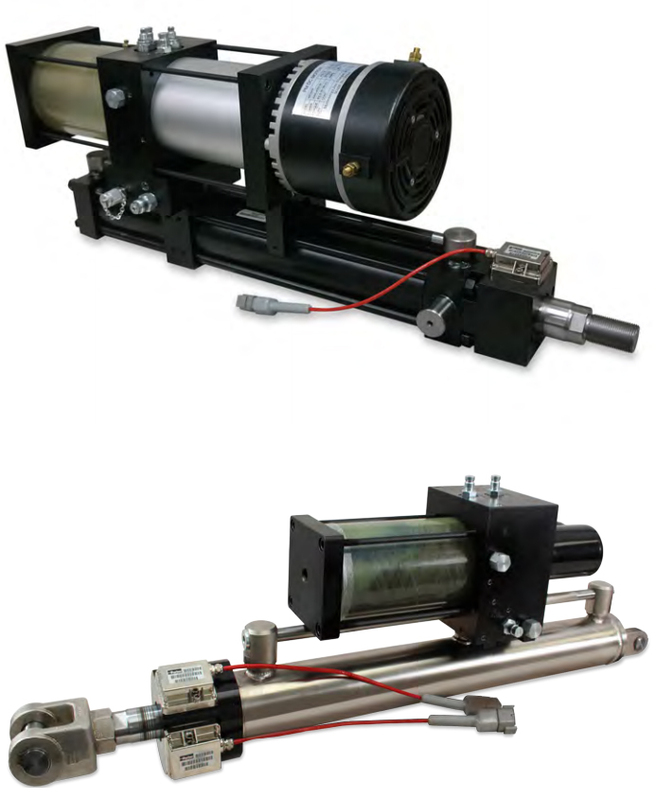 We control direction by changing the direction of the electric motor, speed is regulated by controlling the pump RPM and thrust is regulated by controlling motor torque, pressure loss is held to a minimum not wasting energy as in traditional hydraulics. Our HAS units are hydrostatic, meaning fluid in contained into a closed loop system. The return fluid is directed back into the pump rather than to the reservoir. Since the actuators have different volume requirements due to rod area, make up oil is drawn/returned from our integral reservoir. Our patent pending reservoir design is sealed with a barrier that expands and contracts like a lung, keeping airborne contaminates and moisture from being ingested into the system. Our design also reduces reservoir sizes from 10’s of gallons to less than a gallon of fluid. In electromechanical designs, similar control concepts exist; speed, direction and thrust are controlled by controlling the motor. However instead of moving fluid, the motor is coupled to a screw, and with the actuator’s rod connected to the nut. So as we turn the screw, the nut cause the rod to extends and retract. Screw style actuators have a set life, and can be complicated when sizing/selecting the proper actuator for the job. They also must be lubricated to maintain such life. They are very ridged devices and are prone to damage when exposed to vibrations and shock. Our Hybrid Actuator System design utilizes the same motor control concepts as an electromechanical design, but rather than turning a screw, we turn a pump and use the fluid transmission to move the actuator. Fluid does have a slight compressibility and dampens any shock and vibration making it suitable for harsh applications. Reduced Downtime is a key differentiator. With traditional hydraulics, as stated above there are several components in the system that must work together, to achieve motion. If one component fails, it requires a certain skill set to determine which component failed and replace it. This is usually done by trial and error, and the machine is down for days. With electromechanical actuators, the complete actuator is removed from service and a new complete assembly is installed. We refer to this as Line of Use Replacement, and it’s this very feature in the hybrid design that gives HAS “best of both worlds” functionality, in a single new design. Power Density… Nothing beats hydraulics designs in power per size. Hydraulic actuators are typical 1/3rd the size of their EM counterparts. The HAS fully adopted the power density functionality in its hybrid design. What kind of cost difference is there, and does the increased cost of the hybrid actuator justify the design advantages? There are many points to look at when talking costs; installation costs, maintenance costs, replacement costs etc. When comparing unit costs to a centralized hydraulic system, the HAS unit is favorable when compared to 1-2 axis of control. If there are more than 2 actuators, and the plumbing (hoses/tubing) is limited on the machine then a centralized machine is more favorable, as you do not have the duplication of the pumps and motors. However if your actuation is spread out over a great distance, requiring long hose runs as in damper and diverter controls, valve actuation, rather than a localized power scheme, is attractive as it is easier to pull wire rather than hoses and tubing -- thus lowering your installation costs. In Solar Tracking applications, the Parker HAS design can be more expensive when compared to low end low thrust Electric Cylinders purchased in quantity used to track forty panels or less. However, HAS units are most effective to larger scale applications, starting at 100 panels (smallest) and capable of moving in excess of 1200 panels. This reduces the installation and maintenance cost significantly. The sealed reservoir on the HAS is virtually maintenance free, only require an oil analysis every 5 years to determine if an fluid change is required, similar to your automobile. With HAS tracking actuators OEMs are not required to add shock absorbers and other dampening devices as the HAS units are self-dampening, which allows additional savings. What kind of Power Gen applications are you seeing the hybrid actuator used in an what cost/performance have your customers seeing? HAS units recently introduced to dual axis solar tracking and expanded into single axis. Previously they experienced frequent failures from the electric tracking actuators. We have received nothing but positive feedback on the construction and robustness of the actuators. Recently we have expanded our offering with versions developed for damper and valve actuation controls. The minimal reservoir size and ease to add failsafe is attractive in Hydro Pelton and Turgo turbine control. Click here for more information on Parker's actuation solution.